As summer is in full swing and June is dwindling down the next big summer event is the Fourth of July! 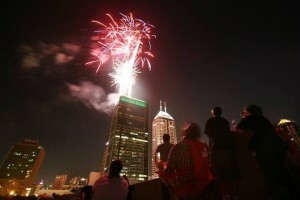 Indianapolis, IN and the surrounding communities have plenty of events for celebrating our nation and partaking in some Fourth of July festivities. If you don’t have plans yet we have compiled a list of some area favorites for you to explore. Zionsville in Lions Park. Don’t miss an All-American July 4th Celebration in Lions Park. Music, food, and fun begin at 5pm on the Saturday, July 4th with fireworks following. In case of rain, we’ll celebrate on the 5th. Concerts on the Canal. The Indiana Historical Society presents Concerts on the Canal which take place every Thursday evening. A special concert will take place on the canal on Saturday, July 4th. The Indianapolis Municipal Band will play from 5pm to 6:15pm and Naptown Boogie will play from 7:30pm to 9:30pm. The 2015 Food Truck Firework Festival. Come to downtown Indianapolis, IN for the Food Truck Firework Festival, featuring Henry Lee Summer along with Satisfaction – A Rolling Stones experience. Starting at 5pm, come enjoy both bands plus DJ Ohbeone as they play on the outdoor stage, followed by the spectacular downtown firework display from the city’s best viewing location. In addition to the great live music line-up, over 20 of Indianapolis’ best and most popular Food Trucks will be on-site to provide downtown’s most unique and extensive menu for this one-of-a kind event! If you are traveling to Indianapolis, IN this summer to celebrate the Fourth of July and are interested in learning more about what this great city has to offer please contact an Indianapolis, IN real estate agent. We’d love to hear from you!